I recently bought a B&H Model 627, which is the English version of the 240T, I believe. 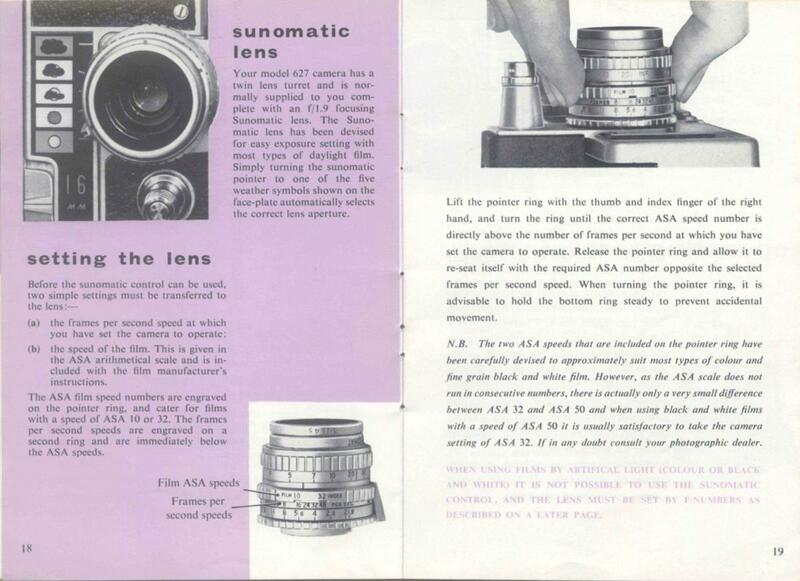 It came with the standard "sunomatic" 20mm lens, but I'm a bit confused by the film speed markings the manual outlines. Does this mean the lens can only worth with really fast film speeds? I've not seen 10 or 32 speed film. The fastest I've seen is 50. Help? Those film speed and frame rate settings on the lens are just for the rather vague "easy exposure" symbols next to the lens. Made for amateurs who didn't have a light meter or found the whole metering thing too hard. You should use a light meter and set exposure with the f stop marks on the lens. Good advice. It seemed an extraneous, confusing thing. I'm not ashamed to admit how green I am, so maybe someone could also help with field of view for this lens? Is 20mm considered wide in 16mm? Or is it closer to what a 50mm would see in 35mm? 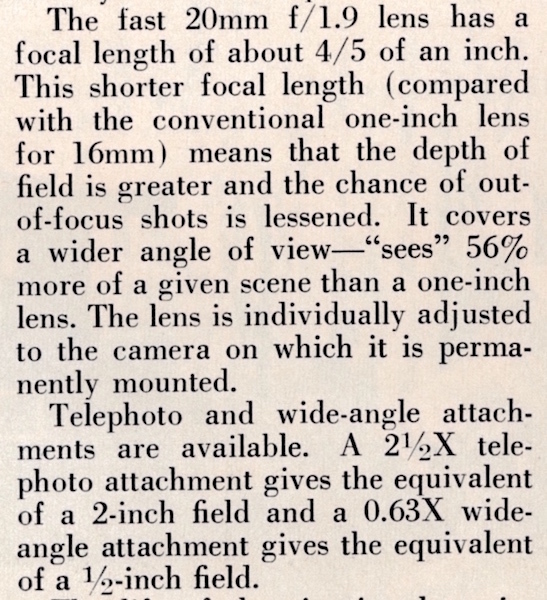 It's a bit wider than the normal mid-range focal length that older 16mm cameras used to come with, which was typically a 25mm or 1 inch lens, but not as wide as the standard wide angle which was often a 10mm. I wouldn't get hung up on comparing focal lengths in other formats, particularly as you can get confused with Super and Standard 16, Super and Standard 35, full frame stills 35 and various aspect ratios within those formats. Just get familiar with the lens you have on the format that camera uses, and if you feel the need to go longer or wider, try a different lens. It probably helps to have the matching finder lens though. I DO have the matching finder lens, for both the 20mm and the 2.8" (70mm?) TT&H telekinic. Judging from the finder, the latter is a close-up lens. I've been puzzling away about filter sizes for these lenses and I finally noticed the one in the manual is stamped "Size 4.5." What filter system is that? I was assuming/hoping the diameter would be 39mm, so I could use the Cokin system. Size 4.5 is the old 'series' filter sizes. You'll have to find them on the used market now. Starting in the 1930s, filters were also made in a sizing system known as a series mount. The filters themselves were round pieces of glass (or occasionally other materials) with no threads. Very early filters had no rims around the glass, but the more common later production filters had the glass mounted in metal rims. To mount the filters on a camera, the filter was placed between two rings; the mount ring either screwed into the lens threads or was slipped over the lens barrel and the retaining ring screws into the mounting ring to hold the filter in place. The series designations are generally written as Roman numerals, I to IX, though there are a few sizes not written that way, such as Series 4.5 and Series 5.5. Most Series filter sizes are now obsolete, production having ceased by the late 1970s. However, Series 9 became a standard of the motion picture industry and Series 9 filters are still produced and sold today, particularly for professional motion picture cinematography. 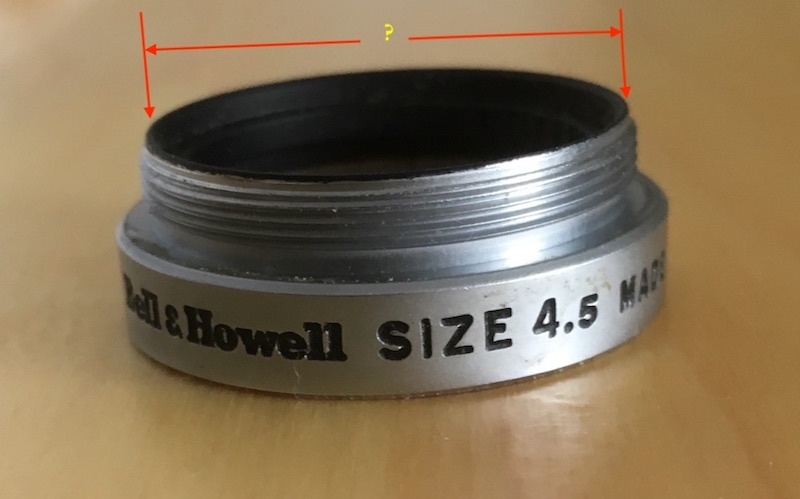 Measure the size of your series 4.5 retaining ring (26 - 28mm I think), then see if you can find a step-up ring. You may need several step-up rings screwed together to get to the size you want. Took some measurements on both the 20mm Super Comat lens and the 2.5". The retaining rings' lip isn't wide enough for the stamp, so they're probably still series 4.5, just a later version. The 20 measures 28.44mm on the retaining ring, according to my digital calipers. Any help is welcome. These seem like oddball numbers to me. They are only oddball in this day and age. You are looking for retaining rings, adaptors, step-up adaptors, lens hoods for lenses that were made 50 - 60 years ago. It used to be you would go to your local camera store/shop, and they would have a kit from TIFFEN, EDNALITE, KODAK that had all the small screw-in size rings. You'd pick one out and try it on your lens. If it didn't fit, you had a size that you could start from and look for another ring. 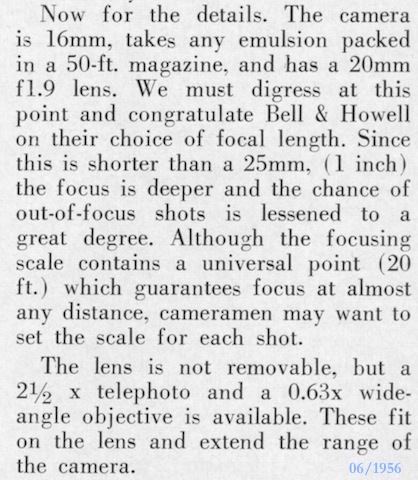 Or, the camera dealer would get the right size from the distributor or manufacturer for that lens. But that doesn't help now. Now you have to search Photo Collectable shows, garage sales, eBay or search the internet for the vintage lenses. What size filters do you have now? Do you want to adapt them to your lenses? It may take years to find a Series 4.5 filter that you need. We have a guidebook for sizing lens...include all specs when inquiring. He lists a couple of Photo shows also. No matte box that I know of. You would have to build your own camera base plate and support rods, then fit a matte box to it. That's a lot of info! Great stuff! I initially bought the Cokin system for my super 8 camera, which has a diameter of 55mm. The ideal option would be to adapt these filters to the 16mm camera, so I wouldn't have to buy multiple sets. I would just as soon not fart around looking for 60 year old filters. I'm more interested in shooting than collecting. I will be shooting negative stock and scanning, so it doesn't really matter if I have to colour correct in post. I just prefer to do as much in camera/on set as possible. It's how I was taught to work in the theatre. And filters are very helpful to get a good exposure. There's only so much you can do with a garbage shot.